Great concept and a good size for light commuting, a slightly cheap feel though. Cover a rucksack in reflectives, fluoro colours or lights and it's in pretty much the perfect position to make you seen from behind. UK company Proviz's Nightrider rucksack has all three so should in theory be a commuter's best buddy. We took a look at the large rucksack a while back and this small version is, well, a bit smaller. Just 10 litres in fact or 410mm x 260mm physical size. For a light commute, few tools, bit of lunch that kind of thing there is ample space and you'll still be able to fit a bladder in the rear pouch on hot days. There is a key/mobile phone pocket on the front just above the reflective light tab and a small pocket on the side so you can keep your smaller items a bit organised. The shoulder straps are adjustable for size and contain a couple of guides (one each strap) for your bladder bite valve plus keeping everything secure when loaded there is a chest strap. Keeping a bit of airflow between your back and the bag are a couple of foam pads providing around 10mm of clearance. 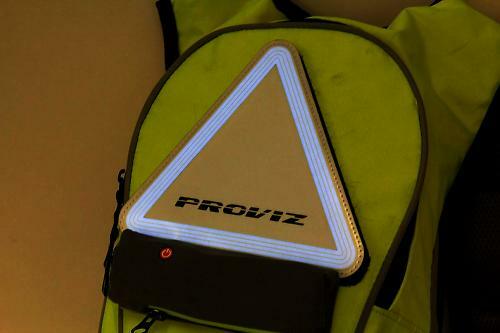 Proviz are all about making you visible and the rucksack has loads of reflective material positioned right where car headlights are likely to strike it. 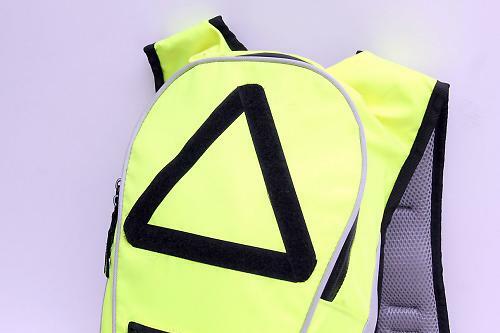 It comes with a Velcro attached reflective triangle as well which can be replaced with the Triviz electroluminescent kit (more about that in a minute) should you so desire. Here we've got the fluoro yellow version which makes it ideal for overcast daylight and dusk/dawn conditions but there is also a black version with the same amount of reflectives. Rip-stop fabric is used pretty much everywhere and it's some hardwearing stuff shrugging off scuffs and knocks without leaving any marks plus its easy to keep clean. Water resistant zips do their best to keep the rain out but an hour's prolonged rain will see it get through here and the material so your contents are going to be a bit on the damp side. Fit wise things are pretty good as its very lightweight and the straps are easily adjustable to get things snug and secure. Those foam pads provide some comfort on your back but they compress too easily to provide any real heat escape so you do get a sweaty back. On the whole though I feel that the Proviz Nightrider does have a feeling of cheapness about it considering its £30 price tag. The zips feel a bit flimsy and the material very thin which makes me worry a bit about long term durability. In its defence though the rucksack has stood up well so far to over a month's worth of daily commuting with no signs of damage or failure apart from the zips sticking occasionally. 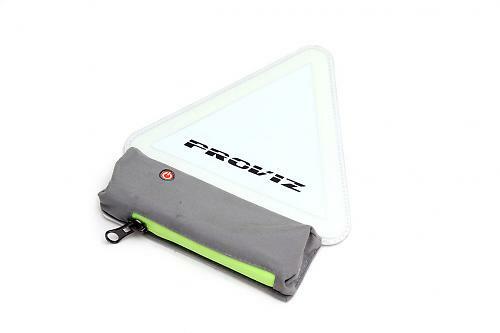 The Nightrider is compatible with their Proviz's lighting system which is a rechargeable battery operated electroluminescent light in the shape of a 16cm warning triangle. Available in either red or blue it can transfer between other bits like jackets or bags in the rest of the Proviz range so handy if you've got some other bits of kit. You get three modes, static, fast flash and slow flash which'll give between 12 and 16 hours of burn time on a 4 hour charge. It isn't super bright but its something a bit different which makes it stand out a little bit more, especially the blue as you'll hear some traffic behind being a little more hesitant about going for that dodgy overtake. One thing to bear in mind though is that it sits quite high up on the rucksack so the lower/racier your position the less likely it will be seen. The Nightrider has seen some proper soakings but it's still going strong and the claimed burn times seem to be realistic although I expect them to drop a bit once the temperature is closer to the freezing mark with the battery pack sitting quite close to the elements. Priced at another thirty quid on top of the bag it's not bad value for what it does but again there is a slightly cheap feel about the materials used and vagueness in the on/off button. Overall the Proviz Nightrider rucksack is a great concept providing loads of visibility in dark and dull conditions and paired up with the Triviz lighting system it's a good bit of commuting kit. It's comfortable and will carry a decent amount of stuff yet the dimensions are pretty small to so if you break your journey up with a train ride you're not going to need to take it off to get in through the door. For short or infrequent commutes I can see it serving you well but I'm not sure if it's up daily use and abuse. "The smaller cousin to the PROVIZ Nightrider rucksack (large) is designed to be the perfect all in one day-sack. Highly visible, reflective, water-resistant and ample storage along with being liquid bladder ready should you wish to add one on those hotter days. The rucksack is also compatible with our unique USB rechargeable TRIVIZ light pack that is attachable/detachable in seconds." As far as a visibilty aid goes its brilliant with loads of reflectives and the Triviz light. Tidy enough but just feels a bit cheap. Very good with regards to reflective properties but the Triviz only works for more upright riding styles. The material still looks good after a month but the zips aren't the smoothest. Feels very light when on. Padded shoulder straps and back supports are very comfortable. I've used better quality rucksacks from the likes of DHB that were much cheaper. I appreciate smaller run quantities could drive the costs up. 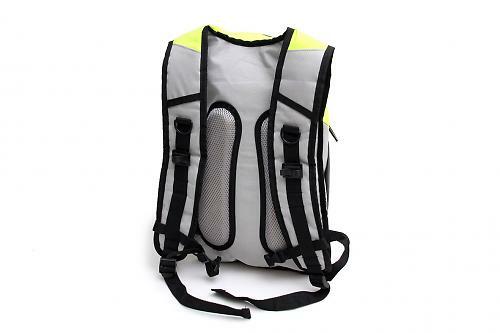 It's a good sized rucksack which makes the most of its available space plus the reflective/light combo works very well. The overall visibility in amongst traffic. The overall feel of the product.